- Gloria J. Katch on 八月 10, 2016. Their sound is like vacationing to some heavenly Spanish destination without leaving your seat. Unfortunately, the rhythmic African beat and spicy Latin flavours urge listeners to dance, move and celebrate to the wonderment of Manteca. Where’s the dance floor when you need one? The Juno award-winning Afro-Cuban orchestral band was one of the highlights of the 2016 TD Niagara Jazz Festival recently. With about 40 acts and recording artists performing in various parts throughout Niagara, the third annual Niagara Jazz Festival offered something for everyone on the improvisational and jazz spectrum. Special guests included many sultry singers and soloists, such as, Liberty Silver and Cinnamon Jones, the contemporary girl band sound of Barbara Mantini and the sweetheart of swing, Alex Pangman, who joined groups to add lyrics and love to the three-day event. There was a cornucopia of jazz flavours, such as the Vintage Jazz Trio, Jumpin Jive Duo, The Worst Pop Band Ever, The Jazz Bugs, Sultans of String and Bar Room Buzzards among many others, who performed throughout the weekend. The new FirstOntario Performing Arts Centre in St. Catharines hosted opening night with the Dave Restivo Trio and Manteca. A three-time winner of the National Jazz Awards for pianist of the year, the Dave Restivo Trio performed something old, something new, but nothing blue. Although, A Prayer for Human Kindness was a little melancholy in a profoundly touching way, and was the most classical piece of his repertoire. It sounds like a musical soundtrack for a drama with sentimental chords and notes that sail and soar. Restivo described it, “as the closest I’ve come to a hit.” Humble indeed. In honour of Herbie Hancock, Restivo created Honeydew Harbour, which was bright, fresh with notes that paint with intricacy like a detailed musical canvass. Restivo introduced the song by saying Hancock wrote about melons in the sixties, and it got him a hit recording, so why not? While it also didn’t garner Restivo a hit, it is a noteworthy composition. His latest recording, The Wave has received a significant amount of airplay on jazz stations, which contains several solo breaks from his stand-up bass player, Clark Johnston, and percussionist, Alyssa Falk. The Bull and the Roses was a dichotomy of uplifting, and yet stormy sound in the lower registers. It would’ve made a great addition to The Bachelor television show after one of the lover’s quarrels. The first track of The Wave is a tribute to Restivo’s muse(s) titled: Kurt and Mark. Restivo plays with elegance and effortlessness. However, the flying pace of his leads make it difficult to catch one’s breath, at times. Exhale Dave. Exhale. Restivo’s special guests, Cinnamon Jones sang the soulful ballad, a daydream about her lover. It was enchanting. The audience sang along to a bluesier version of the Gloria Gaynor’s hit, I Will Survive, than when it was a radio hit, which allowed the audience to feel the lyrics about pride and the strength of independence. Hailing from Rochester, N.Y., Jones, recently wrote a musical play titled, Lady of Song, which she toured around the world in tribute to many female recording artists. She has also opened for many national R&B and gospel groups. Alex Pangman, looking every bit like a girl from the fifties, waiting for her betrothed sailor to return from sea, sang a more tangy and buoyant version of Won’t You Come Home Bill Bailey for a grand finish. The sound of bongo’s drumming filled the auditorium with vibrancy announced the arrival of Manteca. This nine-piece band can take you to the top of the Peruvian mountains and back with its exotic orchestrations that sound like a variety of soundscapes – vast and uplifting. The group opened with The Lowdown and Matt Zimbel, the band’s lead percussionist nearly sprinted on stage commenting how smart the jazz audience looked. That was a perfect segue for Mind Monday from Monday Night at the Mensa Disco, which was released several years ago about an imaginary disco where your I.Q. is checked at the door. Manteca performed a few of their favourites including a soundtrack they did for a film, which was entered into a film festival in China. 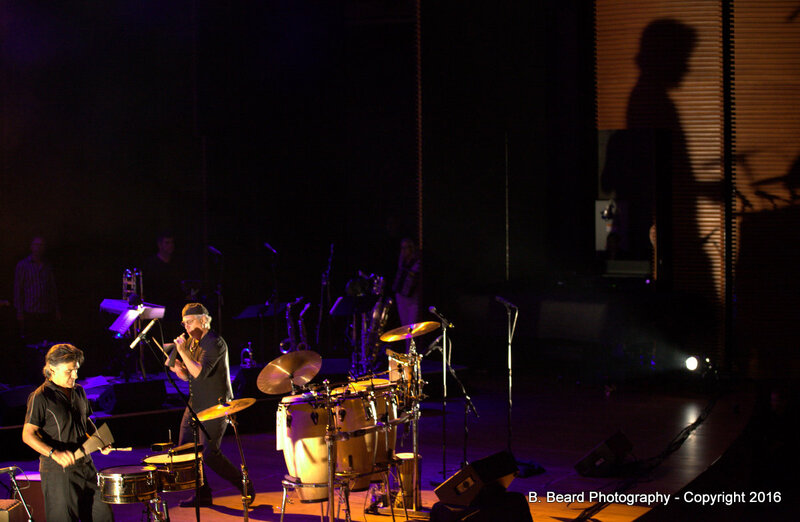 Matt Zimbel, the band’s lead percussionist attended, saying it was very well received, along with the fun fact – Kenny G. is the biggest revolution there. The visual of Kenny G. as a sax God in China drew a few laughs. As did Zimbel’s explanation of the song: Later is Now, which is not a cosmic zen-inspired composition, but rather a dad responding to his son to clean his room — not later, but now! Purple Theory was an innovative piece with modern intonations and a mellifluous guitar break played by Nick Tateishi that added an edgy sound. Radio Noir was a beautiful composition that opens like a dramatic mystery and builds to a high emotional crescendo with the sounds of the horn section and trumpet. Many of Manteca’s pieces contain Afro-Cuban rhythms enhanced by exotically melodious piano riffs, which takes its listener down a path, and then they are swept away by the superb horn section of Colleen Allen and Mark Ferguson. Zimbel joked that Allen plays so many instruments, she needs a caddy to carry them all. Levitate had its audience snapping their fingers, and other times clapping their hands to other renditions. Five Alive and Casserole were uplifting pieces, musical fusions of styles and sounds. Manteca‘s music always contains instrumental breaks to highlight its extraordinarily talented individuals. A robust through-line lies beneath the orchestration, so it never sounds like Manteca took a detour at the Safari and left its audience hanging at the end of a cliff. 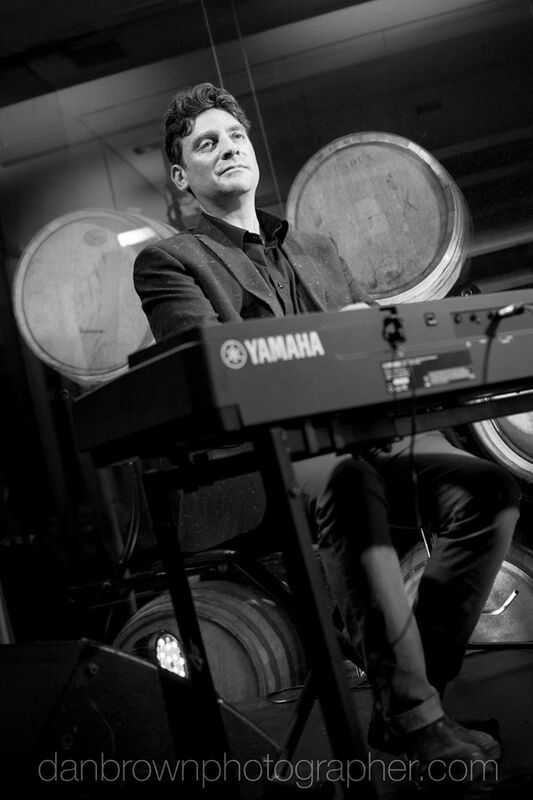 Doug Wilde is remarkable on the piano and synthesizer layered on top of the percussion that helps guide this musical expedition. Drawing from many musical styles, Manteca’s instruments flow together for an amazing adventure and a journey worth taking. Since its inception in 1979, Manteca has released 13 recordings and won a Juno award for Onward in 2007. The group is releasing yet another CD in September, and it will be an ecstatically promising and joyful trip. All aboard!